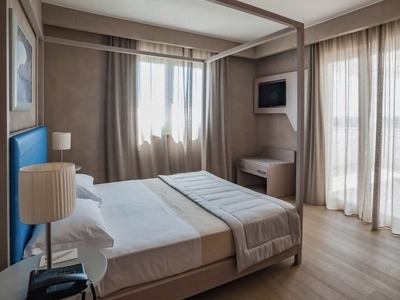 The 58 air-conditioned rooms and suites at Cala Ponte are simple but have a modern, understated elegance to them. All of them are on the first floor of the building surrounding the swimming pool and are spacious with wooden floors and soft linens. Deluxe Double Rooms : comfortable rooms in the four blocks surrounding the swimming pool, with of a double bed with canopy or two separate beds. There is also a sofa -bed. There are two refined and spacious Junior Suites equipped with a double bed, air conditioning, two TVs and a fully equipped bathroom. Cala Ponte Resort & Spa is a new seaside hotel near the port of Polignano a Mare in Puglia, the heel of Italy. If you are looking for a stylish place to stay by the sea with a spa and a laid-back vibe, then this lovely boutique hotel ticks all the boxes. If you are coming to Puglia to explore then we do recommend you hire a car as there are plenty of charming villages and towns to visit in the local area. The nearest, Polignano a Mare, has one of the prettiest squares looking on to the sea and is surrounded by crystal clear waters. Take a stroll here one evening and enjoy an aperitivo in one of the cafes or bars. Also in the area, Alberobello has been a UNESCO World Heritage site since 1996 and is so famous for its trulli (traditional white Apulian houses built in stone with a domed roof) that it is often featured in movies. One of our favourite places to visit is Ostuni, also known as the White City, where all of the buildings have been painted with white lime. It is one of the most visited towns in Puglia and with its narrow streets, little boutiques and Blue Flag beaches it has earnt a reputation for being the prettiest town in the region as well as being the city with the cleanest sea in Italy. Some people just prefer to come to Puglia to put their feet up and enjoy the sunshine, clear waters and fresh food before heading home relaxed and revitalised. Cala Ponte Resort & Spa can definitely help you re-energise: its spa has treatment rooms, ice showers, steam baths, a sauna and a relaxation area. The two outdoor swimming pools are open from May through to October and if you fancy a game of tennis but don't have a partner, the hotel can book you in with a pro on one of the floodlit courts. Sip a cocktail at the bar on the open terrace by the pool or order a light lunch before relaxing in the shade. Breakfast is a casual affair- either buffet or a la carte. Cala Ponte Hotel is in Polignano a Mare, San Vito area. You can reach the hotel by taking the Polignano Nord exit of the SS 16 by car from Bari or Brindisi Airport. Bari Airport, 40 minutes by car. If a cancellation is made within 3 days of arrival, 100% of the total amount will be charged. If a cancellation is made within 7 days of arrival, 70% of the total amount will be charged. If a cancellation is made within 14 days of arrival, 30% of the total amount will be charged. Nice weekend break , great staff,very clean! If you need to iron your cloths better get your own iron with you ! I give this hotel 4 because me and the family had a relaxing time around the pool and it was close to the centre. Breakfast ok nothing special, restaurant the same. Service a little slow. Hotel is new and fresh and easy access. Aperitif by the pool was lovely. Keep improving though! The staff and facility at Calaponte were simply outstanding. Our stay was extremely comfortable as a result of their modern amenities, such as amazing in-suite washroom setup and top-notch pool area, and excellent restaurant. When we decided to extend our stay by one night, they made the process hassle-free by calling the other hotel and informing them of our delay. They were also very gracious to give us late check-out til noon for no charge. The only thing that marred our stay was the poor wifi connection inside our suite. But all in all, a shiny example of excellent hospitality in Italy, and we look forward to returning here in the future. Very helpful staff. Hotel is located about 2,5 km from Polignano a mare, so you can go there to admire a spectacular coast, have a dinner or take a train and travel further. Though location is quite good, but it is better to rent a car in case of bad weather, because there is not much to do, when you can't be near the pool. Nice surrounding, comfortable room cleaned every day. Breakfast every day the same, so do not expect wide variety of food. All in all, I highly recommend to spend calm holiday in Cala Ponte. Very friendly and attentive staff. Buffet breakfast had everything we wanted/needed. Fantastic pool area. The room was perfect and had everything we needed except an iron which the reception staff were more than happy to provide. Comfortable bed. The staff we had contact with had great English speaking skills for the non locals. Great gardens. Less than 5 minutes by Tuk Tuk/Took Took out of the heart of Polignano a Mare. Would stay again!